Duke Energy announced early Tuesday it will permanently close the Crystal River Nuclear Plant that has been shut down since late 2009. CRYSTAL RIVER — Duke Energy announced early Tuesday it will permanently close the crippled Crystal River nuclear plant that has been shut down since late 2009. The company said it is reviewing alternatives, including building a new natural gas plant, to replace the power produced by the nuclear facility. 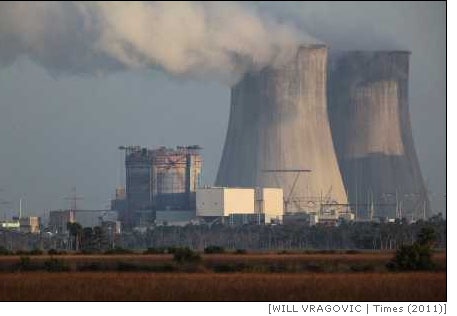 For customers, the final costs to resolve the loss of Duke’s sole nuclear plant in Florida could become staggering – upwards of $3 billion. Customers already are on the hook for $1.3 billion in upgrades and maintenance costs to the nuclear plant, improvements that will now never produce any power. And a new natural gas plant will cost more than $1 billion. They also must pay the growing replacement power bill that has been accumulating since the plant went off line. "This is a stark reminder of some of the of the risks you face in nuclear generation and construction,"said Charles Rehwinkel, deputy state public counsel who represents consumers before the Public Service Commission. "Unfortunately for the customers, it’s a heavy price too, at least it could be." But Duke argues that closing the plant was the best course of action, given the risks and costs of repairing the 36-year-old plant. "We believe the decision to retire the nuclear plant is in the best overall interests of our customers, investors, the state of Florida and our company,"said Jim Rogers, chairman, president and CEO of Duke Energy. "This has been an arduous process of modeling, engineering, analysis and evaluation over many months. The decision was very difficult, but it is the right choice." "The Crystal River Nuclear Plant has been an important part of our generation fleet for three decades,"said Alex Glenn, state president of Progress Energy Florida, a subsidiary of Duke Energy. "We are very sensitive to the impact on our employees at the plant and on the Citrus County economy. "We are working to place as many employees affected by today’s announcement in other positions within the company, and we are committed to working with Citrus County to lessen the effects as much as possible,"he said. The decision to retire CR3, means it will become the first nuclear plant to close in Florida and the first major one to close in the entire southeast United States. "The Commission is currently analyzing and reviewing information to determine the appropriate procedures for retiring CR3,"said Cindy Muir, a spokeswoman for the state Public Service Commission. The move to close the nuclear plant was the culmination of a series of events that began in 2009. That year, Progress Energy Florida, now part of Duke, planned to replace two steam generators and do upgrades that would increase the plant’s generating capacity by 20 percent. The work is relatively routine, having been performed successfully at dozens of plants across the country. Progress, however, self-managed the steam generator replacement rather than hire one of two companies all the other U.S. utilities used to oversee that work. The idea was to save money. In fall of 2009, as workers began the project, they cracked the reactor’s 42-inch thick concrete containment building. They repaired the wall only to discover their efforts had cracked the wall again. The plant has been idle since and costing as much as $300 million a year just to buy replacement power. "This is a problem that came about as a result of an effort to extend the life of the plant,"said Rehwinkel, the consumer advocate. Though other utilities had performed the work successfully, Rehwinkel said, "it just wasn’t in the cards for this plant. It’s a very unusual case." The unusual case led to unusual agreements. A year ago, state regulators approved the state’s largest utility settlement because of damage at the Crystal River plant. The settlement means Duke’s Florida customers are receiving $388 million for money spent buying replacement power with Crystal River out of service. In addition, Duke reached a separate agreement with its insurance company, the Nuclear Electric Insurance Limited, for damage to the plant. The insurance is paying Duke a total of $835 million – the insurer’s largest claim in its history. Mike Hughes, a Duke spokesman, said the insurance money also will benefit customers by covering some of the costs for initial repairs and some of the replacement power bill. But customers still are left with billions in expenses, some yet to come. First, Duke will have to resolve the debt for upgrades and maintenance on Crystal River since 2009 that include $1.3 billion. With the decision to close the plant, there are calls now for that money to be borne by Duke. "The poor choices made by Duke/Progress Energy’s present and former executives leave customers with nothing to show for the huge bills they have been forced to pay,"said Rep. Mike Fasano, R-New Port Richey. Now, Duke has resolved to build a natural gas plant in place of the nuclear plant that would come online "as early as 2018,"Duke said in a statement. Replacing CR3 with a natural gas plant would be costly for customers. Florida Power & Light, the state’s largest utility will open a new roughly 1,000 megawatt natural gas plant later this year at Cape Canaveral for about $1.2 billion. Duke Energy says customers will benefit from the decision to delay the full dismantling of the plant for 40 to 60 years to allow its decommissioning fund to grow and cover the costs. A 2008 study on the Crystal River nuclear plant estimated that decommissioning the reactor in 2013 would cost $936 million. At the end of the third quarter of 2012, Duke’s Florida subsidiary, Progress Energy Florida, reported $621 million in its decommissioning fund. The last nuclear plant to go through that process was the Maine Yankee plant in Wiscassett, Maine, that like CR3 was about a 900 megawatt plant. It took eight years to complete that process, which began in 1997. Duke owns about 92 percent of the Crystal River plant. The co-owners’ share of 8 percent means they also will have to pay some of the decommissioning costs, an amount of less than $100 million. Duke’s four coal-fired plants will remain in service at the same Citrus County complex where the nuclear plant, known as CR3, is located. But the utility plans to close the two oldest coal units within the next two to five years. "It’s hard for the customer to find much to celebrate here,"said Peter Bradford, former member of the U.S. Nuclear Regulatory Commission and senior fellow at the Institute for Energy and the Environment at Vermont Law School. "Yes, it puts an end to the seemingly bottomless exposure that they, the customer, had to imprudent conduct at Crystal River. But there’s all that money gone. "And unless the Florida regulators have a major change of heart – or of brain – there’s no prospect of (customer) refunds for imprudent conduct,"Bradford said. CR3 employed 600 workers. Shutting down the plant will reduce that to about 200 while Duke moves to decommission the reactor, said Hughes, the Duke spokesman. Some of those workers will be relocated outside of Florida to other nuclear plants Duke owns. Times staff writer Jeff Harrington contributed to this report. Ivan Penn can be reached at ipenn@tampabay.com or (727) 892-2332.